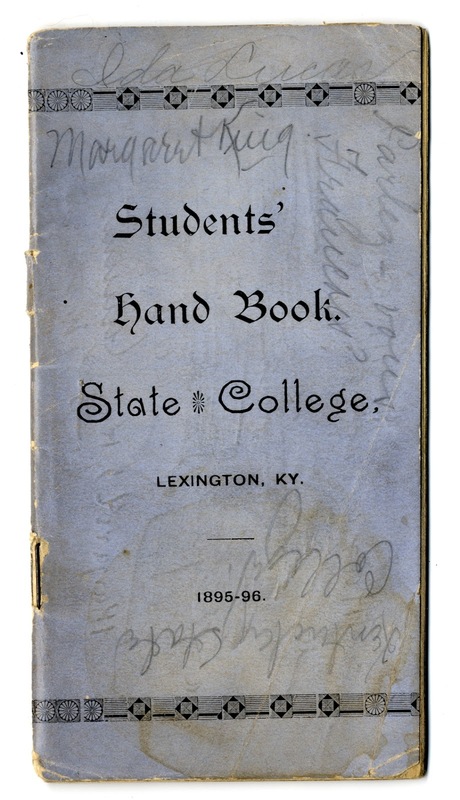 For the 1895-1896 school year, the Young Men’s Christian Association produced the Students’ Handbook for State College, Lexington, Kentucky. In the greeting, the Y.M.C.A. 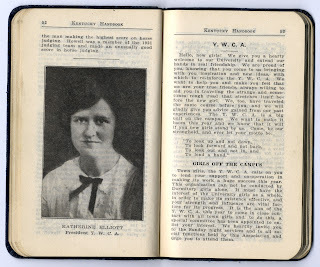 expressed their desire to extend “a glad welcome to those whom we shall meet for the first time within our College walls.” The book included a brief history; the academic calendar; the officers and mission of the Y.M.C.A. ; other organizations; advertisements; and tidbits of interest for the new student. This pocket sized guide for new students became a tradition. · Fix up your room. · Learn yells and songs. · Visit a literary society. · Get a season ticket for all athletics. · If you are an athlete, get in the game. · Get some University colors and Wildcat spirit. · Don’t get to knocking on the way things are fun – boost. · By all means subscribe for the Idea, the official college newspaper. You simply can’t get along without it. 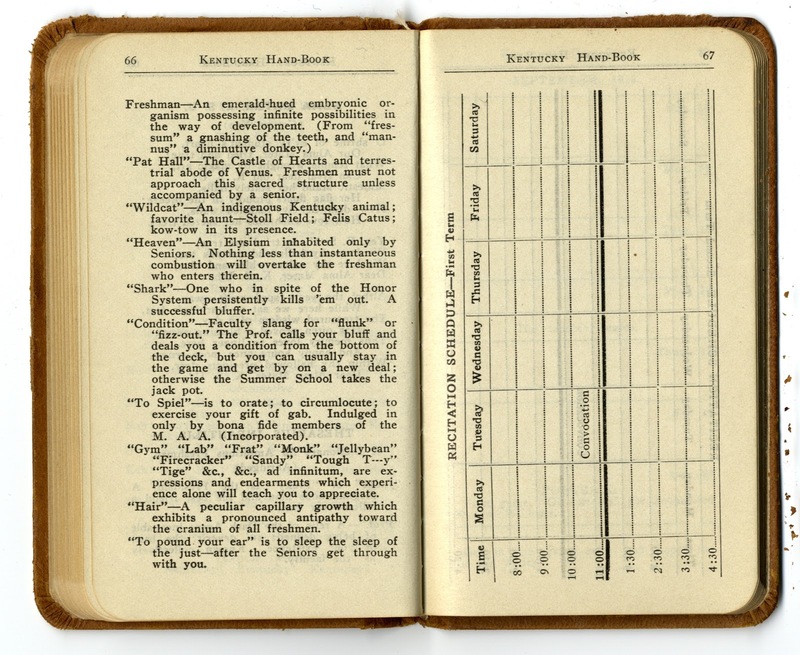 The handbooks were meant to help freshmen gain an understanding of life at UK, become acquainted with campus, and be convinced to actively participate in UK’s traditions. 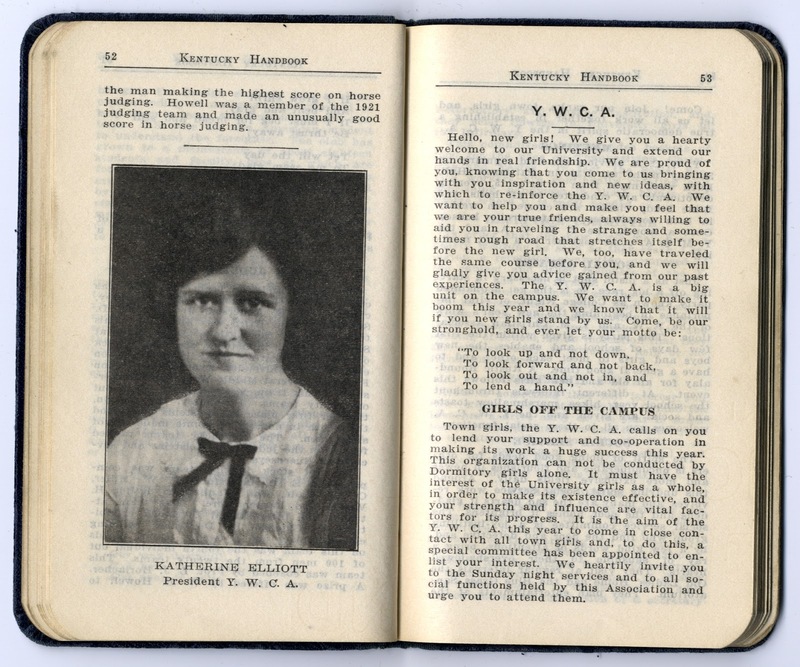 Publication of the book was discontinued in 1917 because of World War I but started again in 1921 and continued for the next 45 years. 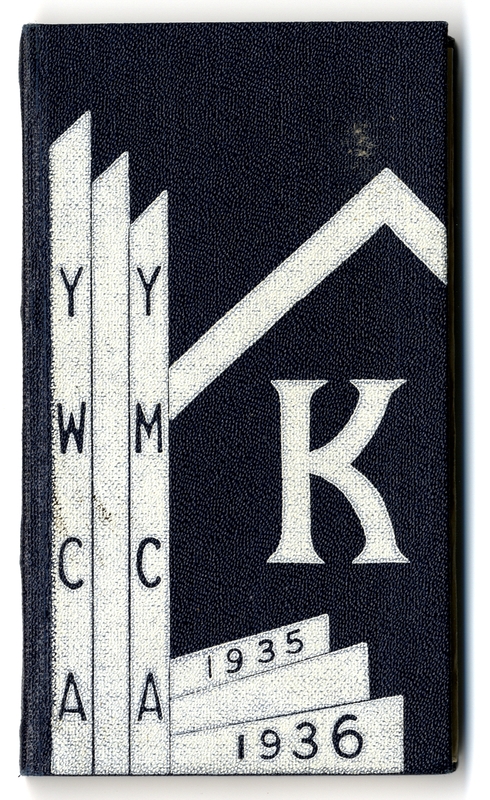 In 2007, a group of student leaders came together to resurrect the K Book tradition – absent from college life and culture since 1966. For the next year, these students wrote a 21st century version of the Freshman Handbook, inspired by the words of students from a century earlier. The result was the new K Book, a fun and informative publication filled with resources for incoming students. Today, the tradition of the K Book continues. From the freshman class to the university’s president, there is widespread support for the publication on campus. The book is given to all incoming Wildcats during the summer before they begin classes in hopes of preparing them for college life at the University of Kentucky. 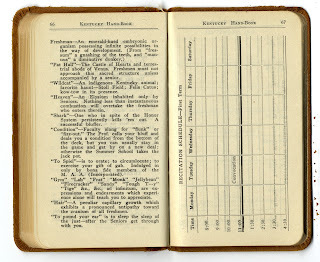 During the year, the K Book Editorial Board, are charged with the responsibility of writing and editing the K Book for the following year. On May 16th, 1901 at 1:15 pm the State College Cadets wheeled from Limestone Street onto Main Street and in front of the Court House, where they stopped. At 1:30, they moved on to Short Street, in front of the lodge rooms of Devotion and Lexington Lodges, where they picked up the members of the Louisville Military band. The procession was formed and escorted by the cadets to State College where the cornerstone of the new gymnasium was laid according to the ancient rites of the order of masonry. The cornerstone items were hermetically sealed in a copper box prepared for the purpose and after it was soldered shut the ceremonies commenced. The items placed within included: a copy of The Morning Democrat, May 16, 1901; a copy of the Lexington Leader, same date; a copy of the Morning Herald same date; a souvenir of the fifth-fourth annual conclave, Lexington; a copy of the bylaws of Webb Commandery; a copy of the bylaws of Lexington Lodge no. 1; a copy of the bylaws of Devotion Lodge no. 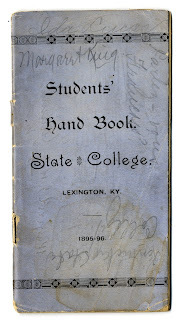 160; a list of the members of Lexington Lodge; a list of the members of Devotion Lodge; a list of the officers of the Grand Lodge; a paper ten cent piece of Federal currency; names of college literary societies; names of members of Greek letter societies; experimental station bulletins; football souvenir; souvenir edition of The Kentuckian; copies of the State College Record; copy of “Brief Announcements”; copy of “Views of the college:’ photographs of the faculty and others; postage stamps of the denominations of one cent, two cents, three cents, four cents, five cents, six cents, eight cents and ten cents; coin silver dollar, 1897; half dollar, 1809; quarter dollar, 1900; ten cent piece, 1900; five cent piece, 1900; one cent piece, 1900; bound volume of the publication of the chemical department of State College of Kentucky during the past ten years entitled, “Researches in Chemistry,” college catalogues; and reports of Board of Trustees. James K. Patterson, President of State College, delivered a scholarly address referring to the struggles and ultimate crowning success of State College. 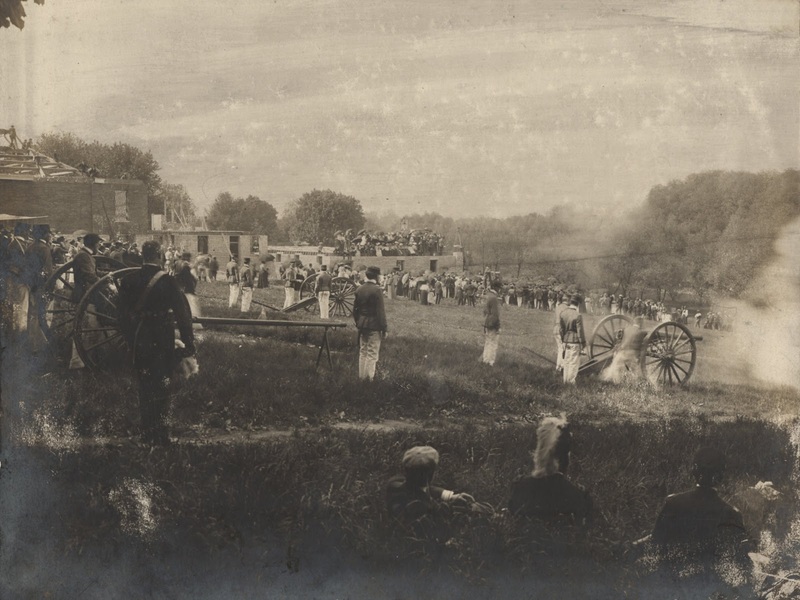 At the close, the college battery of artillery fired a salute of three guns, and as the echoes reverberated through the air the cadets reformed into line, followed by the fraternity of Masons, and the march back to town began. Around 1500 spectators witnessed the events of that day. 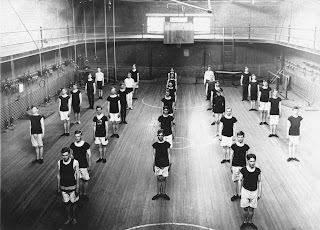 In 1901, the Executive Committee resolved to elect an instructor for the gymnasium who would be a member of the faculty but with only the power to vote on questions relating to the gymnasium and be styled Professor of Physical Culture, earning $1,000.00. It was also ordered that all students would be examined by the Physician and Surgeon of the college who would report which students were able to do gymnastic work. 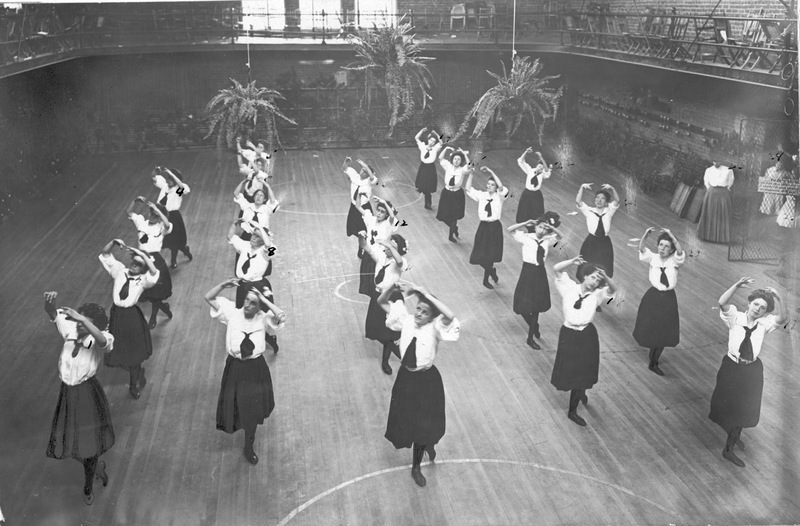 Female students were permitted to take classes or work in the gym but only during the drill hour. 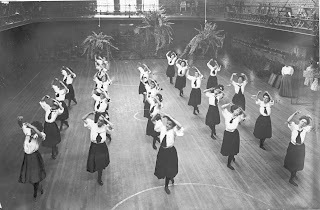 No male students were permitted in the gym proper, baths, or locker rooms during the times set apart for the female students. 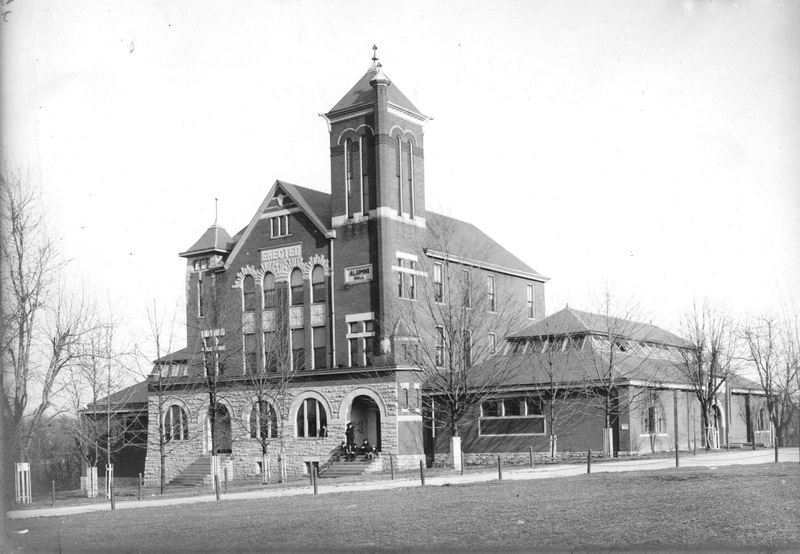 Also in 1901, it was ordered on motion that the Gymnasium be named and known as Buell Hall.